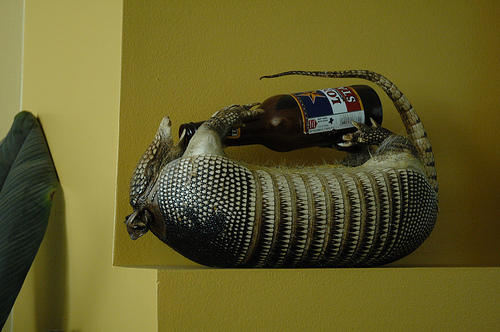 Well, you can drink with impunity in Texas again. Okay, maybe not impunity, but you don't have to worry about getting arrested in a sting operation for being too drunk in a bar. The Texas Alcoholic Beverage Commission has suspended its program to nab bar patrons the commission deemed to be too drunk. There was a recent p ublic outcry against the TABC's actions, which have put 2,200 people in the pokey since August. Oh, and an Austin nightclub (which for some reason is called Dallas Night Club) is suing the state over the sting operations, saying, "The TABC has embarked on a deliberate and knowing course of conduct to drive Dallas out of business. Dallas has lost the bulk of its clientele and millions of dollars in revenue." That seems a little dubious, but at any rate, the sting ops are called off for now. Photo via Flickr, from amelie_anonymous .